Baking a red velvet cupcake recipe is easier than it looks, and we love these vibrant little cakes topped with a luscious cream cheese frosting. The cake base is a chocolaty sponge made with bright red food colouring to give it that rich red shade we love! 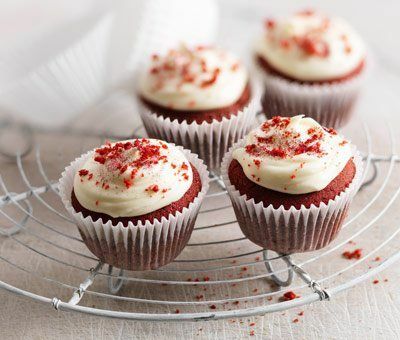 Our Carnation red velvet cupcakes recipe is easy to bake with our step-by-step guide and you can top the cakes with your favourite sprinkles, a few red cake crumbs and red edible glitter to add even more decoration! 1. Preheat the oven to 180°C, (160°C for fan ovens), Gas Mark 4. 2. Place the cupcake ingredients in a bowl and beat with an electric hand mixer for 2-3 minutes until light and fluffy. 3. Spoon into the cupcake cases and bake for approximately 15-18 minutes until springy. Cool slightly then transfer to a cooling rack to cool completely. 4. Beat the icing sugar, butter and vanilla with the condensed milk and cream cheese until very thick and creamy. Spread or pipe onto the cakes and sprinkle with any loose crumbs to decorate! Why not top your red velvet cupcakes with fruit for an even sweeter cupcake? i used paste colour and melted milk chocolate instead of cocoa powder as i don' like the bitterness of cocoa powder. it worked great!!! I make cupcakes a lot with great success. Came across this recipe ts morning and tried it out. They were a disaster. They completely sunk in the middle and when cooled they are very crispy around the edge and almost fudge-like in the middle. Actually the recipe would make a great chewy cookie but terrible cupcakes. Also the quantities given makes way more than 12 cupcakes. Sugarflair gel colours are really vibrant. I find supermarket food colours to be very weak, meaning you have to put LOADS in. hi, just wondering could you use canned condensed milk instead of the squeezy condensed milk? Hi Patricia either product will work equally as well. Hi, I try and get these cupcakes perfect and red. My problem is that I cannot find 'natural red colour' anywhere, I have tried many different brands but they never come out a nice red, always more on the brownish side. Has anybody any idea of a brand that works for the red velvet recipe? would be much appreciated thanks! Hi Chloe! Our advice is perhaps to use a bit more than usual - perhaps its not a very strong colour?